Sweden is a Scandinavian country situated in northern Europe. It is one of those very few countries who despite being a member of the European Union did not join the Eurozone and retained its national currency- the Krona (SEK). Swedes seemed to be too proud of their Krona to adopt a shared currency with the other European countries. A majority of the Swedes rejected the proposal to adopt the Euro back in November, 2003 in a referendum. Since then, many unofficial public surveys have showed the ever decreasing number of Swedes ready to accept Euro. This is why we have prepared a list of interesting facts about (in English it means Crown). The Swedish Krona came into use in 1873 when the Swedish government entered into a monetary agreement with the governments of Norway and Denmark which is known as the Scandinavian Monetary Union. Before that the Swedish currency was known as Riksdaler. After the formation of the Union, the three member countries issued Krona currency based on the gold standard. The Union continued up to the outbreak of the World War I. After the outbreak of the Great War, the Monetary Union was dissolved but the member countries continued to use the name Krona as their currency. This Union from the 19th century showed that the Swedes were not always against a transnational currency system! The Swedish Krona is theoretically subdivided into 100 ore. But the ore ceased to exist in reality when the authority decided against their further circulation in September, 2010. Actually the cost to produce the ore coins exceeded their face value and this led the Swedish government’s decision to discontinue them. The central bank of Sweden is known as Riksbank. Riksbank is responsible for the issue of Krona notes and coins. Until 1902, gold coins were issued in Sweden. However, they failed to maintain the gold standard after that point of time and various other metals have been used so far to strike the coins such as silver, bronze, aluminum, etc. At present, coins of 1 Krona and 2, 5, and 10 Kronor are in circulation. The Kronor coins generally bear the image of the reigning Swedish monarch on the obverse and the reverse carry the value of the coins. The 5 and 10 Kronor coins are made of Nordic Gold- an alloy metal made of copper, aluminum, zinc, and tin. The other coins are made of copper-plated steel. The Swedish banknotes come in different denominations. At present, banknotes are available of 20, 50, 100, 200, 500, and 1000 Kronor. The various Kronor currency notes carry the images of several famous Swedish personalities over the time. 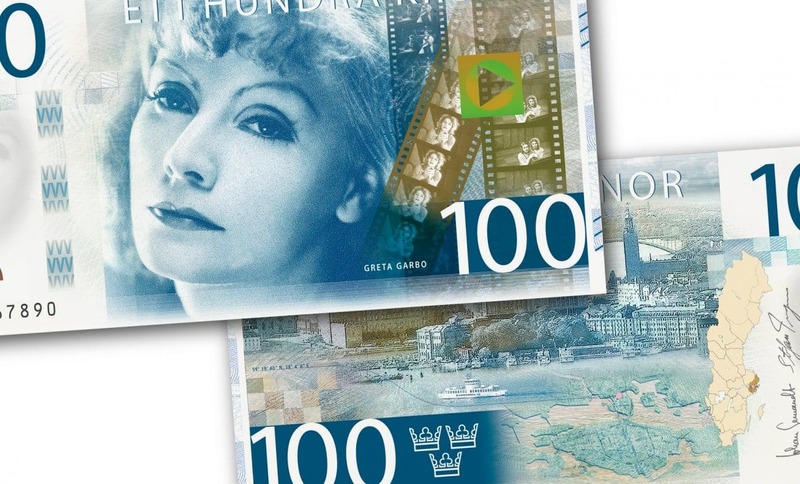 This included the image of Greta Garbo on the 100 Kronor banknote and Ingmar Bergman on the 200 Kronor banknote which were issued in 2015. There is an increase in the use of e-wallet among the Swedes in the recent years. This led to a drastic downfall in the cash transactions and the circulation of banknotes and coins.